Adobe Creative Suite 5.5: Worth the Upgrade? 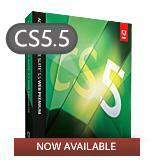 Note the "CS5.5" tag, because it's the exact same box as CS5. Adobe has recently released version 5.5 of its Creative Suite packages. Having recently upgraded to CS5 from a mixed CS3/CS4 environment, I had to ask myself if it’s worth both the trouble and expense to upgrade at this point. One comment. Leave a comment. Adobe has decided to make more of a commitment to customer support. They are teaming up with a global service provider, so I assume that means outsourced phone support. The best place to take your change requests is the Adobe Feature Request form. This is a really, really long post. It’s long both because the Adobe Creative Suite 4 is vast and encompasses many software packages, but also because I found a great deal of things to complain about. While complaining is nothing new for me, finding this many problems with a mature software product is. In this post, first I will detail the problems I encountered using the CS4 products, some action items for Adobe, state a few positives, and an overall conclusion. I do not intend to review all of the new features (which are many). Note that this post is about the Windows version. I believe many of these issues are not present on a Mac system, but I can’t make any assumptions, because I do not own a Mac, nor have I used CS4 on a Mac. 2 comments. Leave a comment.